This article is about the room on Frigate Orpheon. For the room on the Crashed Frigate, see Deck Beta Security Hall (Tallon Overworld). The Deck Beta Security Hall is a hallway on Frigate Orpheon. 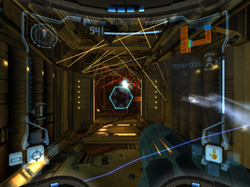 The small hall houses one Auto Defense Turret that will attack Samus on sight. Samus is prompted to use her Missiles in this room. The room is accessible in the Tallon Overworld. Ballistics support needed in Specimen Block F.
This page was last edited on 5 May 2013, at 01:36.